Stamping Sara: Bob (the second) May You R.I.P. Bob (the second) May You R.I.P. We had a slightly sad morning. Our beloved goldfish, Bob the Second, was in bad shape and could no longer swim to the top on the tank (Bob the First suffered a similar fate). He is now flushed and swimming to the ocean (because all drains lead to the ocean) where he will find his new lifetime. We will be going to Pet Smart later today to choose a Bob the Third (or maybe we should try another Betty--she still the original). 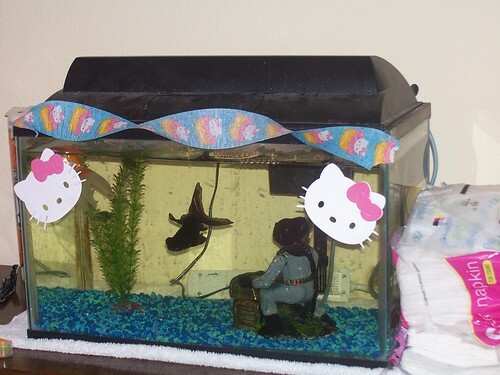 In honor of Bob the Second, I have shared the only picture I have of him (he is the orange one behind the Hello Kitty) when I decked their tank out for Lizzy's birthday party. You were a good goldfish.